I am not in love with Paris. It might be called the city of love, but I don’t think Paris was a city to love. I arrived in its outer sectors on Tuesday, but that part of Paris is dirty. I always thought Paris was rich, but I think I thought wrong, because the city is in a crisis. But that didn’t make my experience of Paris less pretty. It was my first time in Paris and I didn’t even see the Eiffel Tower. What a shame on me. I saw nothing of Paris, so how can I complain when I haven’t even seen it to its fullest. So, la ville d’amour it stays. 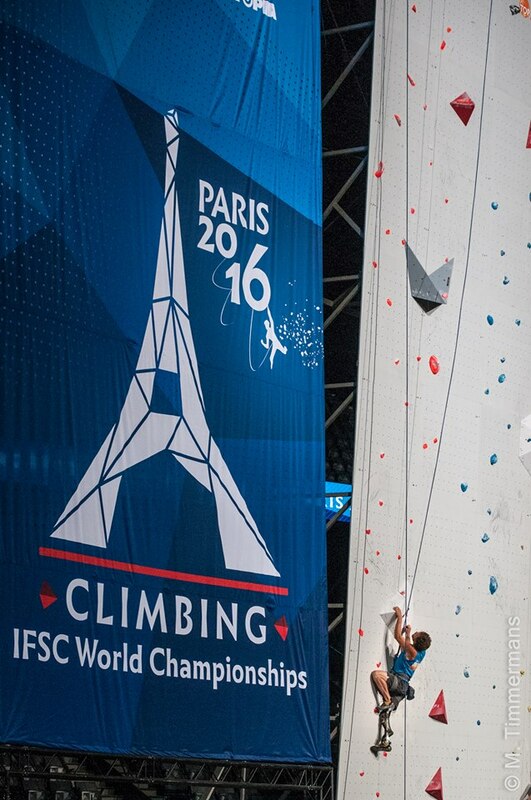 One week in Paris, and I have seen everything that has to do with competition climbing. I have seen “Handi-escalade,” boulder, lead and speed, all in one week. I hadn’t seen many boulder competitions and I hadn’t seen any para-climbing competitions in my life either and it was wonderful. 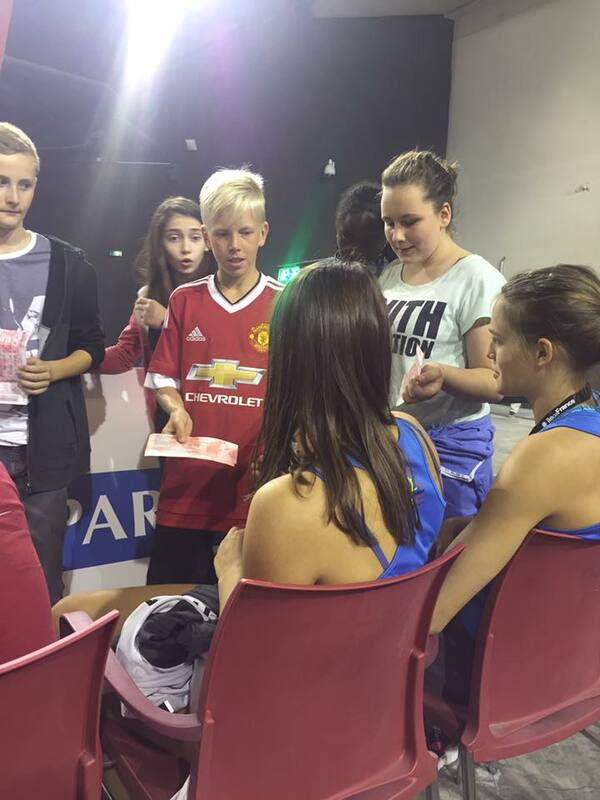 I have learnt so much and I have a feeling that I look at competition climbing from a totally different angle now. I fell in love, not with Paris, but with para-climbing. 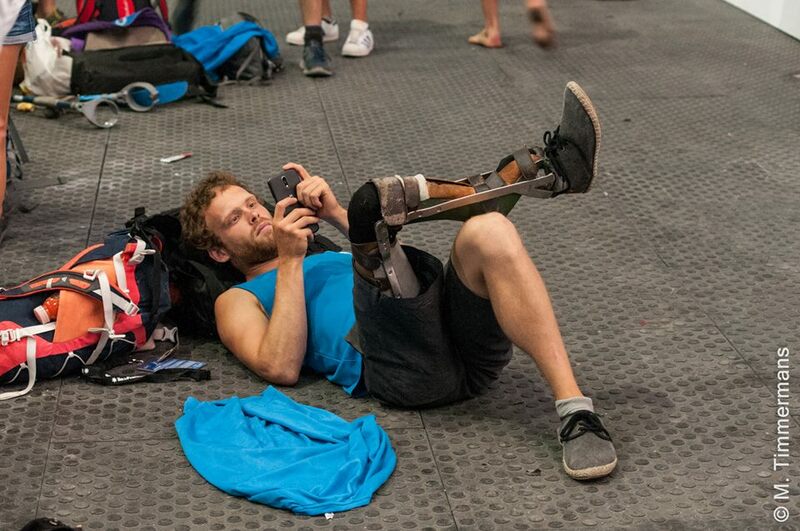 So many emotions, love and so much happiness is experienced in para-climbing. They just love their sport, and their coaches love their climbing. It’s all tangled together and if one falls so does the other. And I love it. 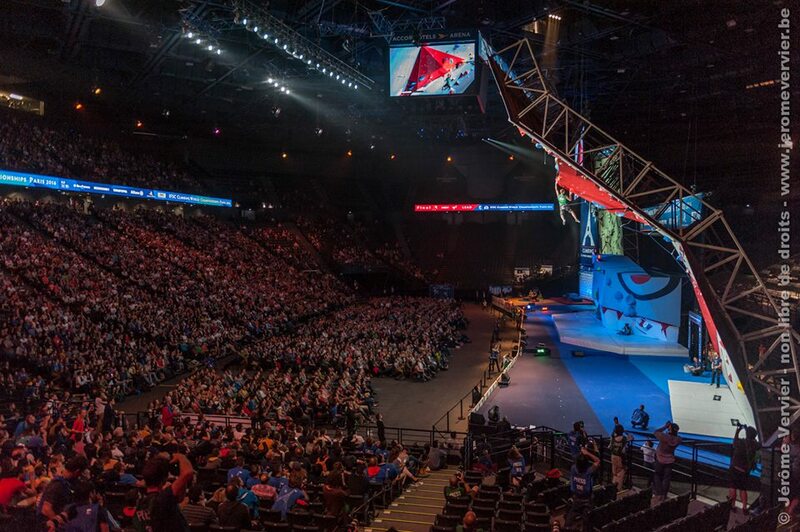 On Wednesday the men’s boulder qualifications, the first qualification of every para-climbing category and the qualifications of the female category lead took place. So, I had to climb too. The day before, we ate some very nice pasta and we got our starting list. Apparently, I had to climb first in group A. I also had BIB number one. The groups were something new to me, they split up everyone in two groups and then you got two pairs of qualification routes, one pair for group A and one pair for group B. I had the left pair on the wall. The routes were very cool and I liked them very much. The blue one was the first route and the orange route was the second. As the first climber, I had to wake up a bit earlier. Entering the arena was dreadful. We had to go through small halls and then we came out at the big arena. We entered through a side door right before the stage. I had the feeling that I was a super star who needed bodyguards and who had a gigantic stage set up only for me. It put an automatic smile on my face. That was until I realized that I had to share the stage with 3 other people though I had the honor of being the first climber. 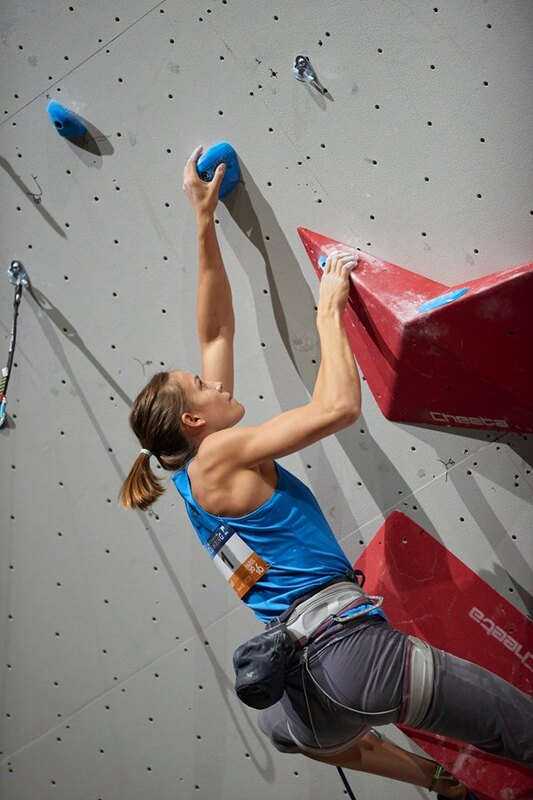 The warming up zone wasn’t so good, there was a little bit of climbing wall behind the finals bouldering wall and the speed wall and that was it. By the time I was warmed up and well rested, I was getting nervous, but I managed to stay calm and collected. I was glad to finally be on the wall. I had to wait a long time before I could actually start climbing. I was kind of excited to climb. 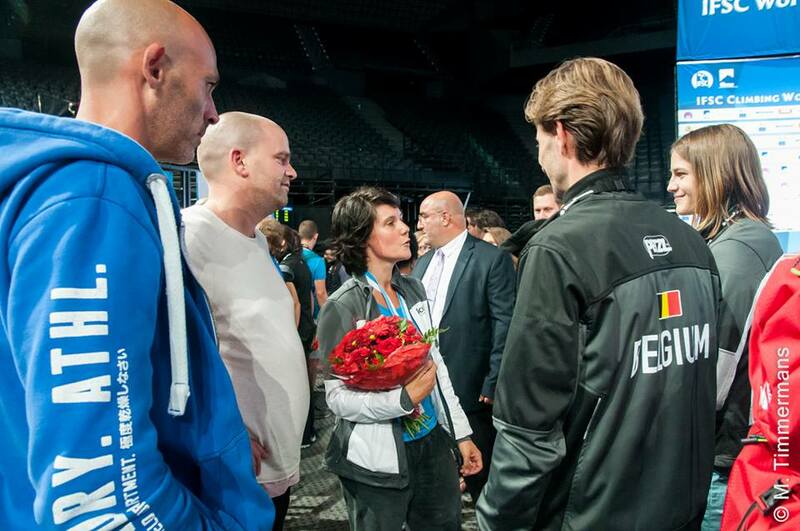 It was the first adult competition where my coach Liselotte was present. I was first for 5 minutes, because right after me come Hélène Janicot and she is way better than I. I really liked the route and I didn’t climb bad at all. I had to do a longer move and that was where I fell. I thought that it was because my hand couldn’t hold on to the hold, but now that I have seen my own video again, I saw that my foot had slipped. The next route was orange. We had to climb in the same order, so I spoke with the same people again. Before us they did the cleaning, so we had to wait a while. I had already put on my shoes, so I took them off again. Then it was finally time, I now realize that I don’t really like waiting. It’s so nerve wrecking. I’m an impatient person. It might get on some people’s nerves as well as on mine. I had read the route correctly and I had studied the difficult moves, so I was ready to start. Starting off a bit shaky, I was getting a bit scared. I needed a good hold to recover a bit from the stress. As if my prayer was answered, I arrived at 2 big and good holds. I was really relieved. I recovered and most of my stress drained away. I climbed higher and my body was getting tired. It was a more powerful route, so after a few hard moves, I fell in the next. I wasn’t one hundred percent satisfied; I wanted to reach a higher point, my aim was at least 2 holds higher. But it was good nonetheless. I was actually a bit sad that the competition was over after that. I would have liked to climb one more route. So, deep down I was hoping that I would be in semis. But that dream is kind of far, so next time I’m going to a World Championship I think I would like to do the boulder competition too. At least then I can climb more routes. It’ll be tiresome, but I would love it. The day after, the para climbing category had to do its second qualification route. And my coach suggested me to coach them. My answer was an immediate “yes”. I did it and I fell in love with it. I learned a lot and I learned that as a coach you have to put yourself in their situation and it is important that you know what your climber is going through to know what they are capable of. And it might seem obvious, of course you have to place yourself in their situation. Because they can’t do the same as you, nor can you do the same as them. But what I realized is that it is the same for coaching non para climbers. You have to know what your climber is feeling, what he or she is capable of at that time. He or she might be able to do more tomorrow than today, so your training will be different. You have to communicate to know. You have to ask. You have to be willing to give an answer. You have to have trust. Because if you are blind, you have to trust your coach so that you won’t walk into a tree. That is what I learned coaching the para climbers. Trust is an important factor when coaching. I had a great time coaching the para climbers. 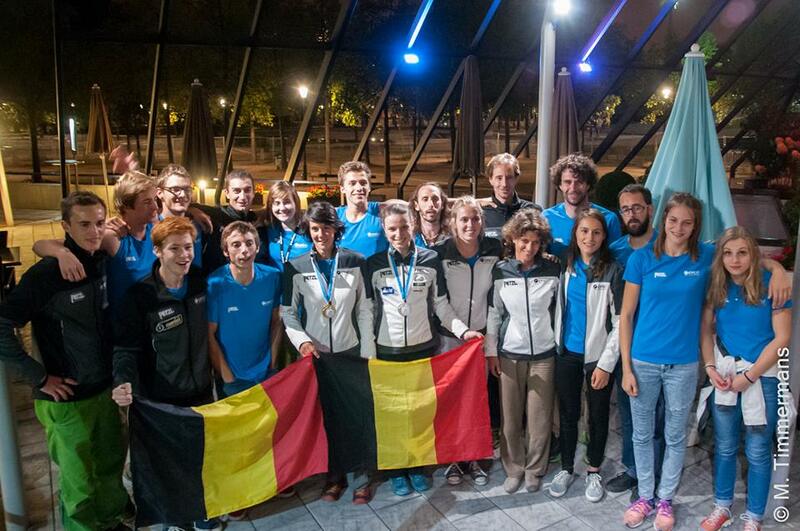 The Belgium team included 2 para climbers: Elodie Orbaen and Frederik Leys. They both did a great job. They climbed very well. Elodie passed the difficult crux and Fré had promised us he would top and so he did. Elfe Claes climbed the same day as the para climbers and at first I was afraid that I would miss her climbing because of me coaching the para climbers. But eventually, my climbers had finished by the time Elfe had to start. I am so proud to say that she topped 2 boulders. She was so cool and I had to hold myself back from screaming out in joy. I had this feeling like a mother has when her child does something great. It was almost on my tongue to scream out “That’s my girl.” No I’m kidding. I think she would not have liked it if I had done that. But she was super cool. And from then on, it was all about supporting our team and having fun. Fun only started when you were inside the building, getting inside used up a whole lot of patience and then your mood goes down ten notches and by the time you want to have fun, all you get is “Tu ne peux pas passer ici.” And then you are like, but my friend and my coach and my team members are down there. And then they are like “Non, on nous a donné des ordres, donc on ne peut pas te laisser passer.” And then the wheels start turning in my head: okay then we will pass at the other staircase where there are no guards. And the whole thing they are trying to accomplish is really useless. I felt like a criminal for needing so many guards to stop me when I’m on my way to support my team. The semis were good, but too bad that our favorite climber (ps: Anak Verhoeven) hesitated a bit at the quick-draw near the top and fell because of it. The boys’ semis were good too. Loic Timmermans won a few places only missing finals by a few holds. And then our third semifinalist, Heloïse Doumont, also won a few places. 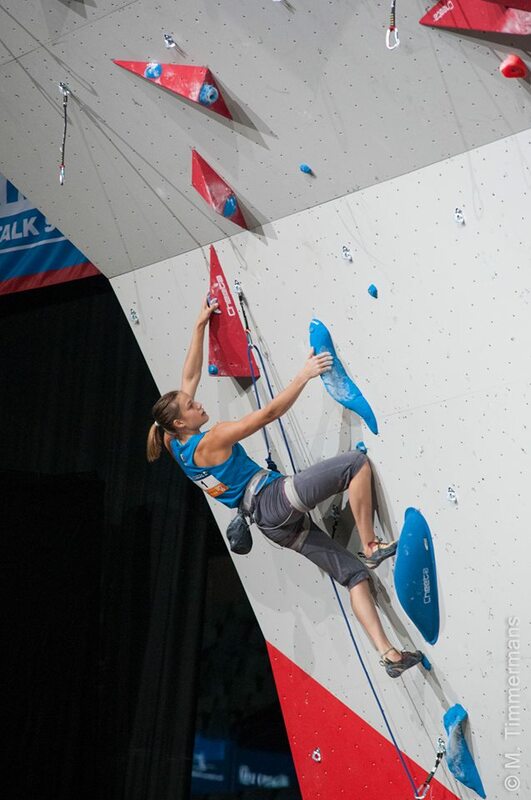 Chloé Caulier did a great job in the boulder semis, but made a few mistakes. It was the day of the finals and everyone was getting anxious. First off, we decided to go extra early so we wouldn’t be late. The gates were not open yet and already there was a giant line waiting to get in. By the time we got inside, it was almost going to start. 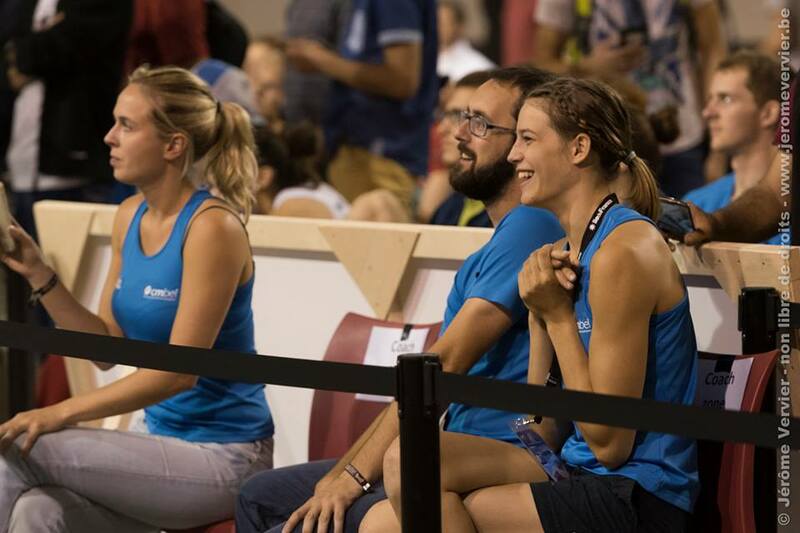 On time, we watched the finals of boulder and lead women. It was amazing. Too bad that the lead was a bit too easy for Anak and Janja. They both topped, making Anak 2nd, not giving her a chance to win. Anak finished her climb nice and clean, not hesitating and not making any mistakes. She wasn’t even tired when she came down. Janja’s performance was flawless as well and we all agreed that she did a better job the day before. After Anak’s climb the arena was in motion. Our team began moving downwards. Me too, with my main goal to comfort Anak. That was until I arrived at Liselotte’s and realized that I was not the only one who wanted to get to Anak. I stopped and stood waiting until there would be less people. Until the pushing would stop. Everyone wanted a piece of her. Even me. And it’s hard to get a piece of her. People are becoming demanding and are skipping the queue. People are running ahead and I’m not joking that people were literally running to be the first person to reach her. And I don’t know the rights of being a best friend, but I think that I don’t need to run to be the first. I should be pushed forward like a VIP. But that is not what the others like. Nobody likes it if people skip the queue for whatever reason. But somehow, it makes me sad that everyone rushes towards her like a magnet, not because I’m jealous, I’m not, I wouldn’t like so much attention if I was sad. But because they didn’t think about how sad she would be. They ran towards her to congratulate her, but only after did they realize that she was sad. I was having some trouble. I didn’t want to race against my teammates to be there for her. But I wanted to be there!! For her. Eventually Liselotte told me to go and I replied that I didn’t want to be part of a swarm swallowing Anak. But Liselotte told me to go anyway. I saw that I couldn’t skip the queue. Because everywhere I went to get closer to her or to stand at a better angle to see her better, the others would follow. We were indeed like a bunch of puppies, sticking together even though we might not always like it. I felt like I was a prisoner and that I didn’t get any space to breathe. She was crying, and sad. I was sad too, just to see her sad. I was sad that she wasn’t happy and I was sad that I had run to be the first to reach her. Everyone wants to be there for her. And the higher she rises, the harder it becomes to reach her. It’s a natural push-and-pull, something no one can resist. We fight it and for that you need to be competitive. But in the end, I was 3rd for as far as I kept track of the competition. I hugged her and she me. I told her that tears were allowed and I almost cried myself. When I was done, I thought that it was totally worth it, because Anak needed all the support she could get. From all the people that look up to her.